L ove your home office, but looking for opportunities to connect with people in real life? That’s exactly why we created our community membership. Ultimately, coworking is about the community – about amazing people with big goals and aspirations coming together to support one another and cheer each other onward and upward. And, we get it. You have an office you love, or have carved out a great space to work in your home. But, maybe you are looking for a little more connection in the real world that doesn’t involve sitting at a coffee shop. We launched the community membership in November and already have a handful of people taking advantage of the features and reaping some of the benefits. 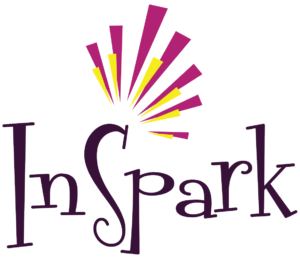 We offer a number of great events every month – Coffee with Creatives (4 times), Writing Accountability Group (4 times) as well as Tech Tuesday, Business Brainstorm, Community Potluck that are each once per month. 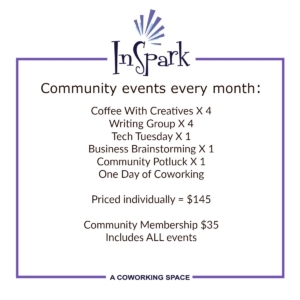 In addition, the community membership allows you to cowork one day per month (plus a bonus day if you also attend our Get Stuff Done Day the third Tuesday every month.) Community members also have a place to put their business cards and flyers/brochures on display. Individually, each of the events would be $10, and one day of coworking is $35 for a total of $145. Community Membership is just $35 per month (or $350 for the year) and includes putting your business card on display in our space! We would love to have you as a member of our community in this way! If it turns out coworking might work for you longer term, we can chat about that as well!